A solvent based fast drying paint developed for use on plastic model kits but which can also be used on a number of other substrates such as wood, glass, metal, cardboard, sealed plaster, sealed hardboard and most other plastics. These 14ml tinlets are available in over 150 colours in matt, gloss, satin, metallic and clear finishes. 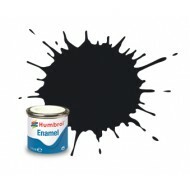 Brush straight from the tin or can be airbrushed when thinned with Humbrol enamel thinners. The usual thinning ratio is 2 parts paint to 1 part thinner. Typically, a 14ml tin will cover an area of 0.3 square metres. Permanent once dry.